Complex stability. Universalism. Announcements and arrivals. The coming. Inauguration. Free spirit. Status, recognition and success. Athletics. Good sportsmanship. Anger. Barter, wisdom, starseed, maturity, ripeness, the sage, the octave, wayshower, negotiations, expanded love, clear perspective, beneficial combinations. As I have indicated previously, one of the things that has kept me on track with The Lightning Path has been the periodic recurrence of synchronicities like those encountered on my journey to Teotihuacan/Tula. They substantiated for me a clear connnection between the symbolism of the Tzolkin and my own direct experience over the years. That experience has been getting progressively more and more collective in nature and perhaps nowhere on The Lightning Path has the experience of congruency between map and territory been more graphic and empowering than during passage through The Temple of Mystery (Sept 20 1998 to Oct 9, 1999). That passage coincided with what is considered by many astrologers to be one of the most significant astrological events of the 20th century: the Grand Cross Alignment of August 11,1999. Astrologers and astronomers map the heavens onto a 360 degree circular grid called the zodiac and it is from this grid that the twelve astrological signs are derived. Each sign characterizes one of three distinct forms of energy: cardinal (initiating), fixed (concentrating) or mutable (distributing). 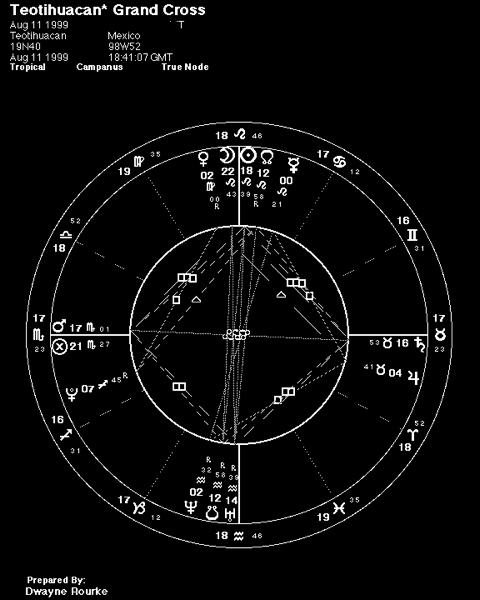 The zodiac maps the cyclic play of these energies over the course of a Solar year. Cardinal times of the zodiacal year correspond directly to the seasonal quadrature delineated by the equinoxes and solstices. They are characterized astrologically by what are known as the cardinal signs: Aries, Cancer, Libra and Capricorn. The fixed signs of the zodiac are Taurus, Leo, Scorpio and Aquarius. They correspond to the times of the year when energies released during cardinal months are given more permanent and powerful form. The four remaining mutable signs, Gemini, Virgo, Sagittarius and Capricorn, distribute the energies concentrated in fixed signs. 1) The hieroglyphic symbol for LAMAT is also called “ star harmony.” Its quadrapartite pattern is in complete resonance with the Grand Cross alignment chart shown below, wherein all but two planets were grouped into the four fixed signs of the zodiac. 2) The Grand Cross of August 1999 occurred during a Lightning Path Moon cycle characterized by number 12, sometimes referred to simply as "complex stability". Astrologically, a Grand Cross linking planets in any signs is stable but a Grand Cross in fixed signs, which is what we have here, is considered to be the most stable of all! Just how complex a pattern a Grand Cross really is can be understood when we realize that its “squareness” is not simply a static phenomenon. Rather, it is a brief stage in a much larger process. Included in that process are a host of constituent sub cycles, each as important as any other. Each planet in the pattern is in cyclic relationship to each and every other planet and with the Grand Cross, a number of these planetary pairs have positioned themselves in one of four different aspect relationships: conjunction, opposition, waxing square, waning square. In other words, there are many relationships involved here and they are all at various stages of development. Upon having discovered this striking correspondence between number, hieroglyph and astrological configuration, I asked myself “What other mysteries lay within this integration of symbolic systems? What larger story is hidden amongst the warp and woof of this mythological tapestry?” Sure enough, as I began to look deeper, a story began to unfold. It goes something like this: I had anticipated the arrival of this Grand Cross for a decade previous. It had persisted in my awareness as a kind of beacon that caused me to enquire repeatedly as to its possible significance. As the actual day of the Grand Cross arrived, one planetary pair within the configuration stood out clearly in my mind: Saturn and Uranus. The cycle of relationship joining Saturn and Uranus correlates to major socio-political changes on the world stage. From this point-of-view, Saturn represents the Status Quo and the psychological function of forming well-defined, clearly limited boundaries and logical, rational systems of thought. In the outer world, Saturn is Big Government, Big Business and all well-established enterprises. Uranus, on the other hand, represents all that serves to disrupt the Status Quo. It represents wildness and freedom, transformation and sudden change. Uranus is the signifier of revolution and is the great disturber of all that is seemingly settled and secure. Uranus is the Great Awakener. During the Grand Cross of 1999, Saturn and Uranus positioned themselves exactly 90 degrees apart from one another, thus forming what astrologers call a waxing square aspect. 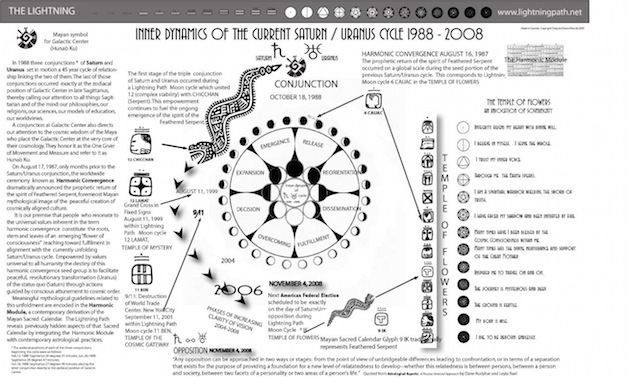 In other words, the relationship between Saturn and Uranus had progressed from a conjunction, where they occupied the same position in the zodiac, to a point where they were exactly ninety degrees apart, thus creating one of the most astrologically stable periods in their entire cyclic relationship. To me, this formation added substance to the overall theme of “complex stability” numerically characterizing the Moon cycle within which the Grand Cross occurred. 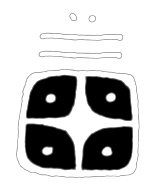 The geometric image of the square itself also clearly resonated with LAMAT, the designated hieroglyph of the moment. To understand the meaning of any cycle of relationship, we must examine its source, the moment of conjunction between the two planets. Identifiable "signature events” in the outer world occur simultaneous to any conjunction and embedded memories of those events subsequently act as morphogenetic fields guiding the creation of new forms as the cycle waxes to fulfillment. Consequently, when it comes to the current 45 year Saturn/Uranus cycle, I consider Harmonic Convergence, August 16, 1987, to be one of the cycle's most significant socio-cultural events. Harmonic Convergence occurred just prior to the conjunction of these two planets and clearly presented to the world at large, a revolutionary Uranian impulse standing in stark contrast to the Saturnian, Status Quo mentality of the time. It evoked through prayer, ceremony and the heart, the Dream of Harmonic Convergence, a dramatic alternative to the Dream of Endless War still so prevalent throughout the world. I consider myself fortunate to have made this link between Harmonic Convergence and the Saturn/Uranus cycle because it has provided me with a kind of sustaining, spiritual support I have not encountered elsewhere. At the time of the Grand Cross, this manifested as a clear message to me that the time had come to do what is most appropriate at the Waxing Square of ANY cycle: take DECISIVE ACTION. For me personally, this translated as doing what I could to bring the Dream of Harmonic Convergence more concretely into form. It became clear to me that I should continue my writing and to work consciously and concertedly toward manifesting some kind of completed Work by the upcoming fulfillment stage of the cycle (2008 to 2010). This website constitutes a big part of what I have been able to accomplish in this direction since that time. See also, my book THE LIGHTNING PATH: Hidden Promise of the Mayan Sacred Calendar. Click here or image to access download page for image. Related Lightning Path posts: here, here. Light measurements during the Total Solar eclipse of August 11th, 1999. Total Solar Eclipse of 1999 August 11 (Official NASA site).